On the Occasion of Mananeeya Eknathji JanmaShati Parva, an All India Janjati Netrutva Sammelan was organised at kanyakumari from 14-17 Sept 2015. The theme was “Sanskriti aur Vikas Saath-Saath - Hum Karenge Ek Saath”. 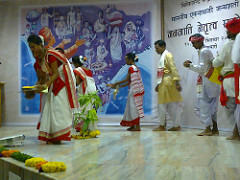 Through Sammelan it’s observer that how much unity there was underneath such beautiful variety. It’s follow up will be in 3 areas: Shiksha, Svaasthya and Sanskriti. On the Occasion of Mananeeya Eknathji JanmaShati Parva, 'Satyakam' - new training centre building was inaugurated by Mananeeya Sri P. Parameswaranji, All India President of Vivekananda Rock Memorial & Vivekananda Kendra at Kanyakumari Vivekanandapuram Campus on 14th September 2015, on the same TITHI of Yugabd 4995, i.e. before 122 years (11 Sept 1893), Swami Vivekananda gave the historical message of Universal Brotherhood at Parliament of World Conference. Ma. Balakrishananji, All India Vice President of Vivekananda Rock Memorial & Vivekananda Kendra, performed the Gou-Pooja. In this occasion senior Life-workers of Vivekananda Kendra also present. 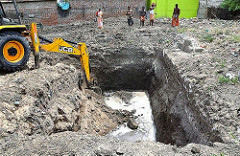 SatyaKam known for his truthfulness & fearlessness in Indian culture, pray the new training centre building in his name strengthen the character of Life-workers, who delicately work for the spreading & inculcating message of the Swami Vivekananda in the society with Man Making - Nation Building Yajna. You can also be part of this Yajna by becoming Patron of Vivekananda Kendra Pratisthan, more detail can be found here. "Our life is projected by the basic bodily needs for sustenance such as food, and shelter is necessary to protect oneself from heat, cold, wind, rain and against dangers. These are the basic wants and vital necessities. But apart from wants, there are cravings in the life of a man and they are different from needs. Desire for a particular type of food, sexual hunger and such other hankerings are cravings and not wants. Sexual hunger is described as a biological need, but it is not a thing without which man cannot live. Wants are most essential for survival, but cravings are not; one can live without a craving. One will not die if one does not have costly, attractive dress or savings or house or similar possessions. These cravings are innumerable and a permutation and combination of them presents a good picture. They arise out of a sense of possessing or owning something." 40% on advance payment (packing & forwarding not included). 30% for the 6 months from the date of dispatch. (if payment is done after 6 months (even after 1 day - no discount will be given). 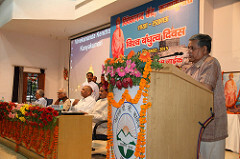 Recalling the contribution of Swami Vivekananda in awakening India and introducing the Indian philosophy of Vedanta and Yoga to the western world, the Deputy Chief Minister Dr. Nirmal Singh said that Swami Vivekananda is revered as one of the most prolific thinker as well as philosophers of present era. The Deputy Chief Minister was speaking at a function organized by the Vivekananda Kendra today at SNS Public School to commemorate Swami Vivekananda’s historical address delivered on 11th of September 1893 in the World Parliament of religions in Chicago. The day is being observed as the Universal brotherhood day to highlight his ideology and contribution. 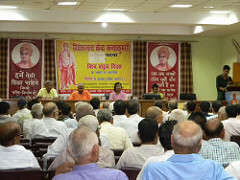 Dr. Singh said that Vivekananda is credited with raising interfaith awareness and strengthening the concept of nationalism in colonial India and bringing Hinduism to the status of a major world religion, adding that Vivekananda’s ideologies find universal acceptance cutting across the barrier of religion and region. Exhorting upon the teachers to draw inspiration from the unique Guru-Disciple relationship of Ramakrishna and Swami Vivekananda in the history of spiritual master which helped Swami Vivekananda to remove his doubts and stride on the spiritual path, he said, “being a teacher myself I feel that we have an pivotal role to ensure that our students think logically and apply positive reasoning in every field, “. 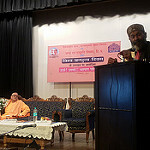 “The younger generation can be the best torch bearers of the legacy of Swami Vivekananda and reinforce a sense of pride in our traditions, ethos and cultural heritage”, he elaborated and added that religion is not just a way of worship doctrines or rituals rather it’s a manifestation of our understanding the divinity within us and the translating the same it into good deeds. The Deputy Chief Minister said that India is on the threshold of change under the leadership of Prime Minister Narendra Modi and we are creating a niche in the socio-political and economic arena. He maintained that India has it’s strength in its spiritual heritage and a beautiful amalgam of different culture and ethos. On the occasion, a symposium was also held on the topic “Swami Vivekananda’s contribution in awakening India” wherein students from various schools participated and highlighted the life and teachings of Swami Vivekananda. Radhika Choudhary, Anjum Akhtar and Haroon Yusuf were adjudged first, second and third respectively in the competition and were felicitated by the chief guest. MLA Jammu West Sat Sharma and Shiv P. Raina were the guest of honour on the occasion while Virendrajeet Singh, Chairman Deen Dayal Upadhaya Research Institute, New Delhi and Chairman DBN Trust presided over the function. G. C. Sanhotra and Dr. O. P. Gupta functionaries of Vivekananda Kendra Jammu exhorted upon the masses to follow the teachings of Swami Vivekananda to make India Vishwa Guru, so that universal brotherhood based on mutual respect and tolerance can be achieved. Swami Vivekananda carried the message of our Motherland to the whole world. Eternal message of our motherland is 'Vasudhaiva Kutumbakam'. The message of brotherhood. In this modern age he delivered the message in most powerful words. West was very haapy and eager to receive the message. To commemorate Swamiji's speech at Chicago, Vivekananda Kendra celebrates Universal Brotherhood Day on 11th September. 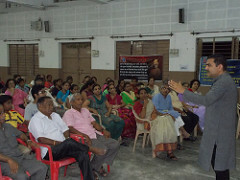 This year a week long programme for youth was conducted by Nagpur branch of Vivekananda Kendra Kanyakumari. Inspiring thoughts of Swami Vivekananda were taken to youth through the competitions like elocution, P Pt/Cliptivity presentation, Bharatiya Samskruti Pariksha and Street Play. The whole event was planned by young karyakartas of Nagpur branch. From their discussion sprang up an innovative idea of Cliptivity ( a short message giving film ) competition and it got very good response. Towards the end of the week a 2 days workshop was organized on the subjects 'Be a Hero' on the 1st day and 'Be and Make' on the 2nd. Shri Sandeepkumar Salunkhe - an IRS officer - who is presently working as Deputy Director of NADT ( National Academy of Direct Taxes ) handled the sessions on both the days and boosted the spirit of the youth to excel in their personal career as well as to devote their time & energy for the society. 400 students from 30 colleges participated in these activities. Culmination of this week long activities was a programme organized on the occasion of Universal Bratherhood Day. Programme started with prayer followed by introductory remarks by Nagpur Nagar Sanchalak Dr Hedawoo, superintendent, Govt. Medical College. A song 'Dharma ke liye jiye . . . ' was sung by sanskar varga students. On this occasion Kendra Activities were introduced to the audience. 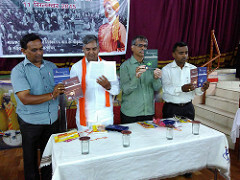 The book DARSHAN DHYEYASAKTICHE brought out by Vivekananda Kendra Marathi Prakashan Vibhag depicting ma Eknathji's reminiscences in Marathi written by Shri Arun Karmarkar was published in the programme. Chief guest Shri Sandeepkumar Salunkhe emphasized on the importance of positive thinking and using the energies for the betterment of the society in his inspiring talk and video clips. Shri Sandeepkumarji, Dr Hedawoo and Nagpur Nagar Pramukh Sushri Gauri Kher distributed the prizes to the winners of the competitions. Mementoes were bestowed upon the young karyakartas of Kendra who have passed secondary and Higher Secondary Exams. The programme ended with vote of thanks and Shanti Mantra. Two Universal Brotherhood Day programs are organized in Kamrup bivhag at Guwahati today by VK Branch Guwahati. One at Ugratara Nagar, Guwahati with 270 attendance and other by Initiative of a Kendra Karyakarta Smt Minati Dey Ulubari Vistar Pramukh in a NCRT Teacher Training Program with 70 teachers from different districts of Assam. Swamiji's Chicago address was read and discussed amongst the teachers after deliberation on the Importance of the day by Smt Minati Didi. 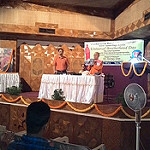 In Ugratara Nagar Swami Devaswarupananda Maharaj Assistant Secretary R.K.Mission Guwahati was chief guest. In His deliberation Pujyapad Maharaj ji narrated the background of Swamiji's journey to the World Parliament of Religion, its impact on West and East. Dr. Saraju Das Former HOD Dept of Philosophy Handique Girls College, an Educationist and Social worker was Guest of Honour. She emphasized on Swamiji's call to the youth of India. Three books were released. A group of ten Karyakartas presented a chorus on the occasion. The follow up program with five yoga satra in Guwahati was announced. On 10 September for the first time in newly formed Kamakhya Nagar UB Day was celebrated. Attendance was 28. Man. Meera Didi was present as speaker. Swamiji's life from Naren to Swami Vivekananda, His realization in Sripad Shila the solution of National problems as Raising the dormant spirit and organizing the mass and the purpose of attending WPR was the core of lecture. One more program on Universal Brotherhood Day had been organized at Vasistha Nagar, Guwahati on 13 September 2015.